The seventh row of the periodic table is complete, resplendent with four new names for the elements 113, 115, 117 and 118. The seventh row of the periodic table is complete, resplendent with four new names for the elements 113, 115, 117 and 118. The International Union of Pure and Applied Chemistry (the organisation charged with naming the elements) has suggested these should be called nihonium (Nh); moscovium (Mc); tennessine (Ts) and oganesson (Og) and is expected to confirm the proposal in November. The three former elements are named after the regions where they were discovered (and Nihonium references Nihon the Japanese name for Japan). And “oganesson” is named after the Russian-American physicist Yuri Oganessian, who helped discover them. After years of having to make do with temporary monikers while the elements were officially being added to the periodic table and evaluated by the IUPAC, these new names are much welcomed by scientists. Alas, those calling for names in tribute to great folk of popular culture have gone unheeded; Octarine (the colour of magic, according to Terry Pratchett), Ziggium (in tribute to David Bowie’s alter ego Ziggy Stardust) and Severium (in tribute to Alan Rickman and via Severus Snape) will not adorn the updated table. Instead IUPAC have followed their rules which stipulate that “elements are named after a mythological concept or character (including an astronomical object); a mineral, or similar substance; a place or geographical region; a property of the element; or a scientist”. But there wasn’t always such an organisation overseeing the names of the elements. Most of them have come about via contorted etymologies. So to give you an idea of the diversity of the most famous of scientific tables, I’ve turned it into an infographic and summarised a few of the eytmologies in numbers. Two of the elements stink. Bromine means “stench” and osmium means “smells”. France also appears twice on the periodic table in the form of francium and gallium (from Gaul) and its capital city, Paris, gets a mention (in the form of lutetium). Three sanskit words – eka, dvi and tri, meaning one, two and three – were prefixed to elements and used as provisional names for those that had yet to be discovered. Eka- is used to denote an element directly below another in the table, dvi- is for an element two rows down and tri- is three rows beneath. Russian chemist Dimitri Mendeleev first used this nomenclature to fill in the gaps in his early periodic table, so element number 32 was known as eka-silicon until it was discovered and named germanium in 1886. Similarly, rhenium was known as dvi-manganese until 1926. Some 14 elements have had eka names including our four new additions which before their discovery were known as eka-thallium, eka-bismuth, eka-astitine and eka-radon. Four of the elements are named after planets (Earth – in the form of tellurium, Mercury, Neptune and Uranus). A further two are named after dwarf plants (Pluto and Ceres), while one after a star (helium from the Greek for the sun - Helios) and another after an asteroid (Pallas) feature on the periodic table. Five elements are named after other elements: molybdenium is from the Greek for lead, molybdos, while platinum comes from the Spanish platina meaning “little silver”. Radon is derived from radium, zirconium has its roots in the Arabic zarkûn meaning “gold-like” and nickle is from the German for “devil’s copper”. Eight elements were first isolated from rocks quarried in a the small village of Ytterby in Sweden. Four of those elements are named in tribute to the village (ytterbium, erbium, terbium, yttrium). 15 are named after scientists, only two of whom were women: Marie Curie and Lise Meitner are immortalised in curium and meitnerium. 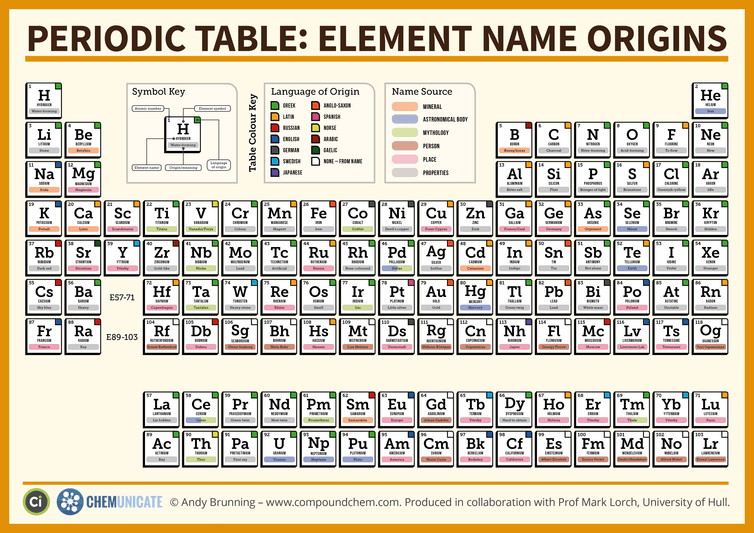 18 elements have had placeholder names derived from the Latin for the elements atomic number (for example ununoctium, now oganesson). This was introduced to stop scientists fighting over what their discoveries should be called. Nobody wants a repeat of the three-decade long “Transferium Wars” when battles raged between competing American and Russian laboratories over what to call elements 104, 105 and 106. 42 elements’ names are derived from Greek; 23 from Latin; 11 from English; five are Anglo-saxon; five German; five Swedish; two Norse; three Russian, and one apiece for Japanese, Sanskrit, Gaelic, Arabic and Spanish. 118 elements appear on the periodic table, and the seventh row is complete, but that doesn’t mean the table is finished. Laboratories around the world are busy smashing atoms together in an attempt to forge new even heavier elements. The hope is that before long these latter day alchemists will hit upon the fabled “island of stability”; a region of the table that harbours elements with half-lives much longer that the sub-second lives of nihonium, moscovium, tennessine, and oganesson. This article was originally published on The Conversation and republished here with permission. Read the original article here. The latest addition to the periodic table is the heaviest yet. The discovery of the most stable elements in the Periodic Table led to the garish lights that define big cities. Joel F. Hooper explains. The United Nations has declared 2019 the International Year of the Periodic Table.